Useful PDF to Text Freeware Reduces Workload! Got to update a PDF file, but it happens to be a read-only file? It would be a dreary and massive task to rewrite and copy file content all over again. As a matter of fact, you can get rid of the task with ease, for a handy freeware would make it much simpler and easier! With a useful PDF to text freeware, you can access and update your PDF content anytime, anywhere. Here we would give you an overview on the available PDF to text converter freeware, helping you greatly reduce your workload. What You May Want From A Free PDF to Text Converter? Knowing what we want to get from a free PDF to text converter, let's take a look at several PDF to text freewares as below, to see whether there is one best suit your needs. You could try the web way to convert PDF to text as it could save you time on installation. Just take Zamzar as an example. This website seems to support converting PDF to text and many other kinds of file formats. To get it work, you need to finish 4 steps, browse to your file, choose output format, fill your email address then convert. 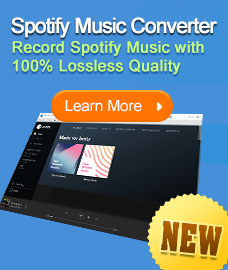 You will get 100MB limit and convert 5 files at one time. Disadvantages: You need to sigh up and even pay to get more than the limit, get rid of the ads or have other further enhancement like speed, priority conversion, secure conversion(128 bit SSL). Since you need to convert online and get output download link via a received email, conversion will not be available if no stable network condition is provided. The text output will be a mess if there is image in your PDF file. 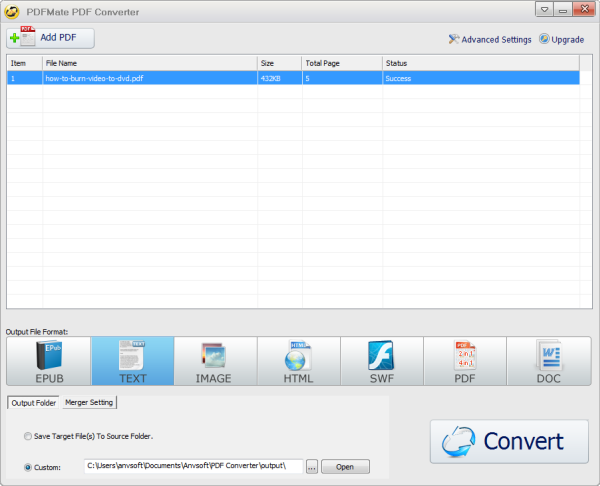 If you prefer desktop freeware, some PDF to Text Converter could be a fast one. 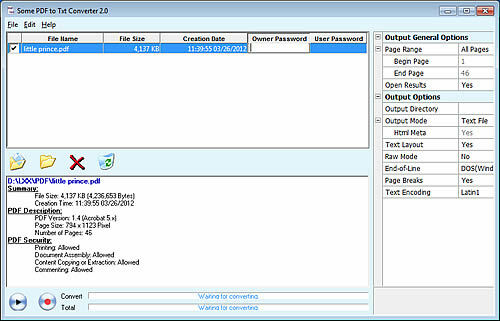 It supports batch conversion and encrypted PDF file converting, capable of converting Master Password protected PDF-file. The conversion tool will ask for a password during conversion. Just type in the password and the conversion process will continue. Disadvantages: You need to fill your email and name to subscribe their website, otherwise, the program will be inaccessible. When installing, the Avira program warming it is an insecure installation file. As for the output text, this software can not handle well with the PDF file that with images inserted. You can see blank area right in the previous images' position, the format of text is awful. You need to manually delete the blank area to get it back to a normal look. It's a multiple functions PDF freeware which support to split and merge your PDF file, extract to text and other file formats. When before starting conversion, it will ask you to name the text file and designate output folder. There are options for customize text output like defining the words space, convert by line or paragraph, detect leading space, etc. Disadvantages: The converter interface is not so straightforward. It's been for a while to get clear about all the buttons and their functions. As you can see from picture above, the preview of the PDF seems not a pleasant one, characters are not in right position. For the text output, the customization settings doesn't seem helpful for preserving text format. 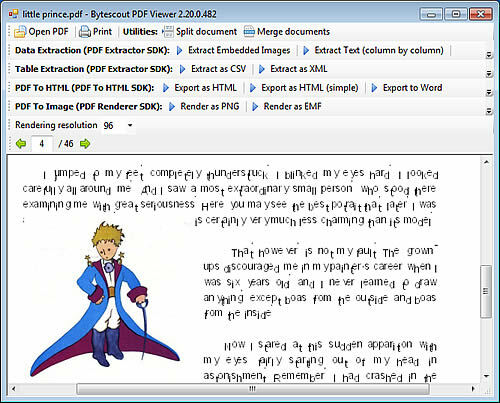 If you are user that emphasize on the text output quality, PDFmate Free PDF to text Converter would suit your needs. This 100% free PDF converter has a nice capability on output text with well preserving format. Apart from outputting text in neat form, it would also separate different page with space and page number. You can easily find the needed content for further editing or other file creation. The initiative interface allow you to easily get familiar with the tool and make full use of every option. Batch converting mode allows every common users converting PDF to text within seconds. Free of ads, no email address or other subscription required. Disadvantages:Though it can convert PDF to text fast with well formatting, it would be of great help to count the encrypted PDF file in the supported file and include more custom options like words space adjust, leading space detecting, etc. Reviewing all the pros and cons of the PDF to text freeware, we can see that PDFMate Free PDF Converter can do the best job as a PDF to text freeware. After installation, you can convert your PDF files to good formatting text for further file creation which would greatly enhance your work flexibility, no need to worry about whether there is a stable network. Moreover, it is a 100% free PDF to text converter, no licence, no limit, no undesired subscription required but totally free of ad! 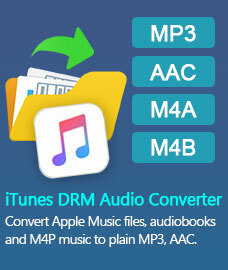 In fact, it is even more than a free PDF to text converter. Including text, it also supports converting PDF to Word, EPUB, HTML, SWF and JPG. If you are searching a handy Free PDF to text converter with best performance, PDFmate Free PDF Converter Could be the one.